A few weeks ago, I wrote about the permanent acquisition of a Frank Lloyd Wright house at Crystal Bridges Museum of American Art in Bentonville, Arkansas. I mentioned that I had once visited another of the famous architect’s preserved houses in Alabama. Frank Lloyd Wright’s architecture stands all across the United States. He designed the original Taliesin in Spring Green, Wisconsin as his home in 1911. From that time until his death in 1959, Wright lived in the home and continuously changed the structure and the surrounding landscape, which included buildings that he had designed for his family. Situated on a broad mesa, the compound’s colors and textures harmonize with the desert landscape. Until his death, Wright lived, worked, and taught his students at his winter residence. 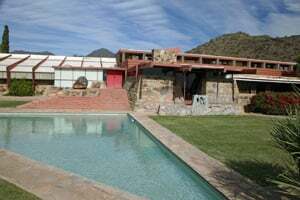 Today, Taliesin West is a National Historic Landmark. 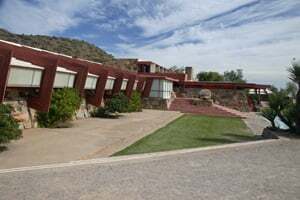 It is also the international headquarters for the Frank Lloyd Wright Foundation. Varying public tours led by guides knowledgeable in Wright’s architecture, life, and philosophies offer glimpse into his greatest masterpieces. Guests are fully welcomed into every room and space—nothing on the tour is behind ropes or under glass. The tours, which include such attractions as the one hour Panorama that visits the Cabaret Theater, Music Pavilion, and Mr. Wright’s living quarters and private office, are linked by terraces and gardens. The tour is filled with majestic views and intimate interior details. Each tour inspires visitors with the innovative principles, beautiful creations, technological experiments, and unparalleled body of work of Frank Lloyd Wright. 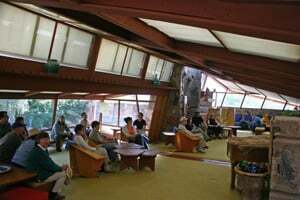 Other tours include a Behind the Scenes tour, or often called the “Extended Insights Tour.” A highlight of this tour is a stop in the colorful Taliesin Fellowship Dining Room where guests are treated to mid-morning tea and some light bites. Often Wright associates speak to the guests and guide them to examine several unique desert structures. Additional tours visit Apprentice Shelters and take walks in the desert. The Night Lights on the Desert tour views Taliesin West in the twilight. 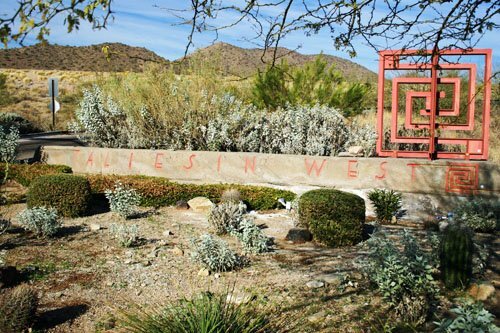 For RVers who head for the warmth and sunshine of Arizona during winter months, a visit to Taliesin West is a memorable day trip. For more information: call (480) 860-2700 or visit www.franklloydwright.org.